A couple of months ago, when I had to make some sample braids for an article, I decided to try a waxed cotton cord I had seen online. I wanted to use something stiffer than embroidery floss, something that would really show the structure of the braids. And also something I could set down partially done to take an in-progress photo. Not a good idea with bonded nylon beading cord, my only stiff-yet-smooth braiding material. It’s too slippery and wild. Sprongs all over the place when you let go of it. I was hoping that waxed cotton would be more well-behaved. It comes in several nice colors, a little on the muted side. The brown colors have a leather-like look, especially the medium and heavy weight thread. The larger spools in my first photo are the medium size—1mm. 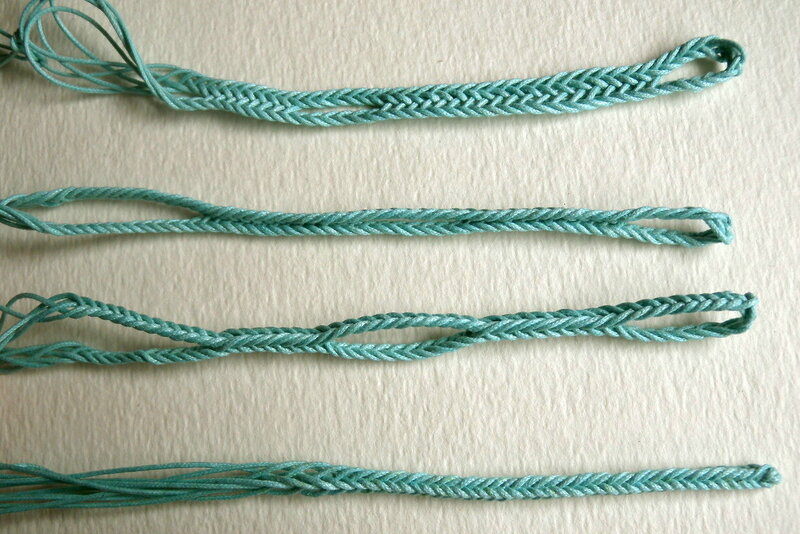 My braided samples are all in the lightest weight, the .5mm size. The only thing I don’t like is that there are occasional grayish spots on the thread. But there aren’t a lot of them; I only once or twice had an instance where I had to discard a length of thread, or had a speck turn up visibly on the braid. The braid on the left does show one of these—actually it’s a bad one, more of a streak than a speck. Half-way down the upper yellow strip, on the left (click on the photo to see it). 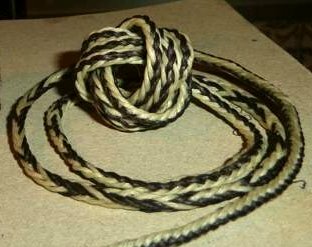 Above is a photo of one of Dominic’s bicolor loop braids in waxed linen—he originally shared this braid in a reader’s gallery post last year. (It was this photo that first got me interested in waxed thread.) His thread looks shinier than my Blue Bird brand waxed cotton. May 7, 2012 in Braiding materials, Tips. Hi Josie, Do you mean my braid samples? Sorry, no I don’t sell those. If you mean the thread, the link to where I bought it is in the post above – Maine Thread co. If you are interested in hand braided items, maybe you could find some sellers on Etsy, good luck! Do you have anything to serve for a dog collar? I though waxed braid would be a good idea, but needed a bigger and longer. I have a large dog btw. Thanks for any idea. I really have no experience with making leashes or dog collars, sorry! I know someone who braided a leash for her (small) dog, I think she used cotton yarn of some kind, and it wore out after a few months. Maybe nylon or leather would be better than cotton? Thanks.. I’ll see if I can make one and let you know in case I succeed 🙂 Great blog and thanks for sharing. You’re welcome, and if it works out, I would love to see a picture of your braided dog collar! 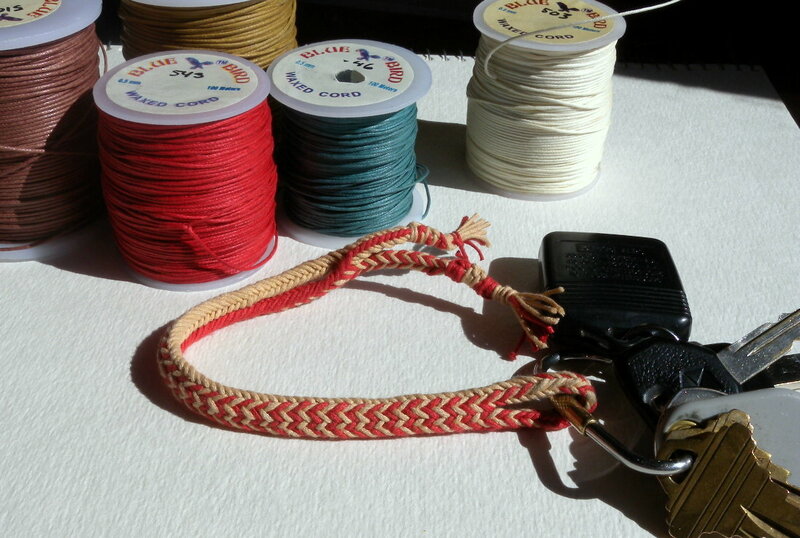 this is a long time after your question, but Dom just posted a pic of a gorgeous braided dog lead–not collar, but related–on his blog. 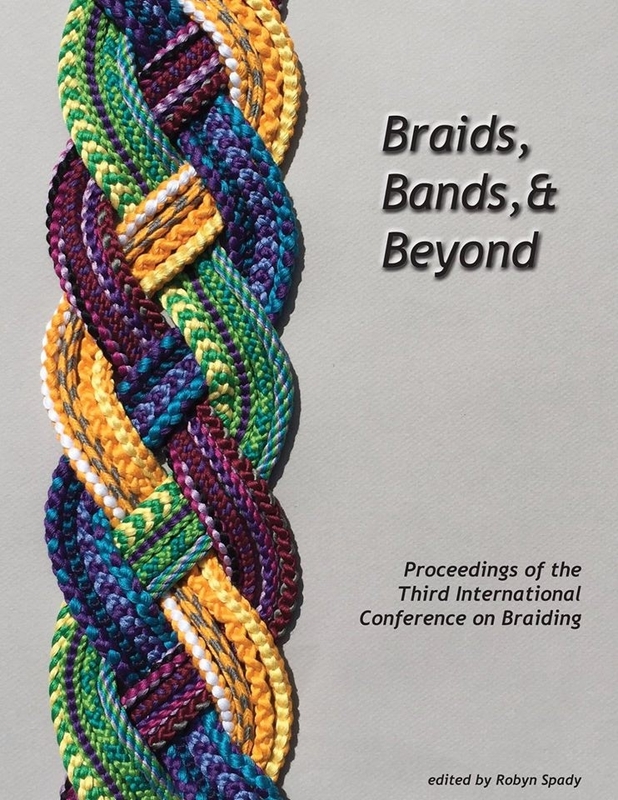 I don’t see why you couldn’t make something similar with loop braiding, though it wouldn’t be as amazing looking without his great knot-work!